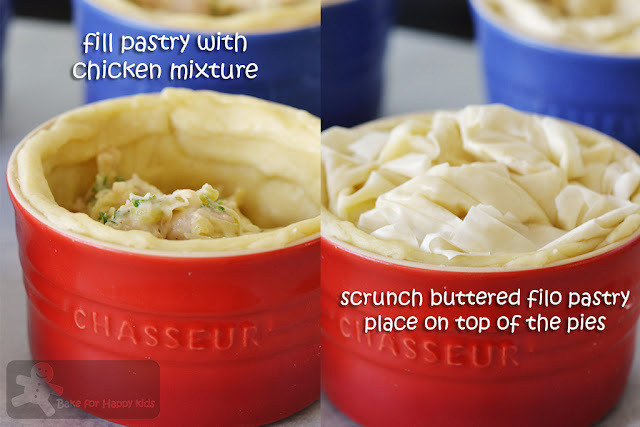 - The always our number one fav chicken pie recipe: Country Chicken and Mushroom Pies and this is the recipe that I have used to bake the pies with Carrie Wong in an episode of Touch Screen Cuisine 弹指间的料理 filmed in Singapore during April 2016. I promise you that this sour cream pastry is the best and has been my personal fave! Flaky, buttery, melt-in-your mouth with a heavenly milky aftertaste and this is why I'm proud to bake these pies and share this fantastic recipe at this prime time TV show. 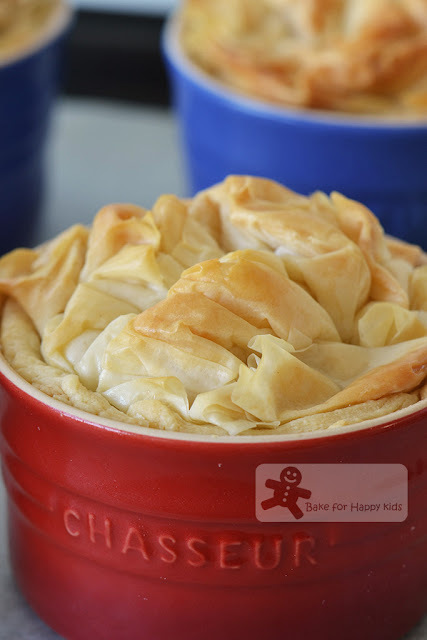 - The always most convenient chicken pie recipe to bake: Fast and Easy Chicken Pies So easy that my son can bake these too! - The always light and healthy chicken pie recipe with no cream: Light and Creamy Healthy Chicken Pot Pies. Relieve to know that these pies won't do too much harm to your waist or thighs? 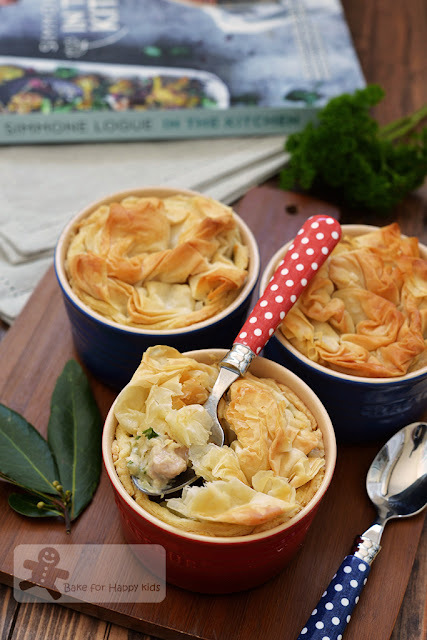 -The always most flavoursome and melt-in-the-mouth chicken pie recipe: Little Chicken and Mushroom Pies. It's true that the filling can melt-in-our-mouth! 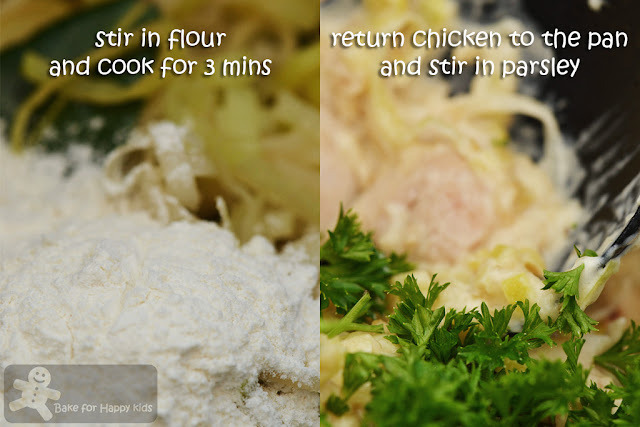 - The always so comforting chicken pie recipe: Hurry up Chicken Pie. Very Southern American style and this is why this pie is so 100% comforting to eat. As you can see, there are so many different variations of chicken pies recipes everywhere... in cookbooks and internet. This is why I never stop trying different types of chicken pie recipes and I'm going to introduce another great one to you. 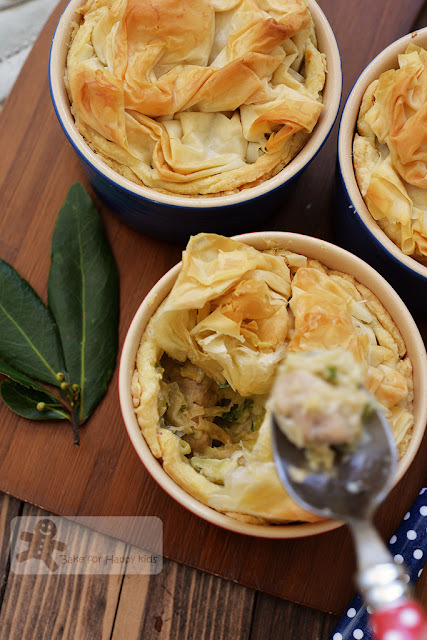 Now presenting these Chicken and Leek Pies with Scrunched and Buttery Filo Tops: I call these the "happily-ever-after-married" chicken pies with delicious buttery crunch and creamy yummy chicken and leek filling. I promise... The first bite of this pie with its filo crunch will surely impress you! Please note that this sour cream pastry is different from my favourite sour cream pastry recipe at here - Honestly, I still think that the sour cream pastry at here is the best and can't fight with this recipe. 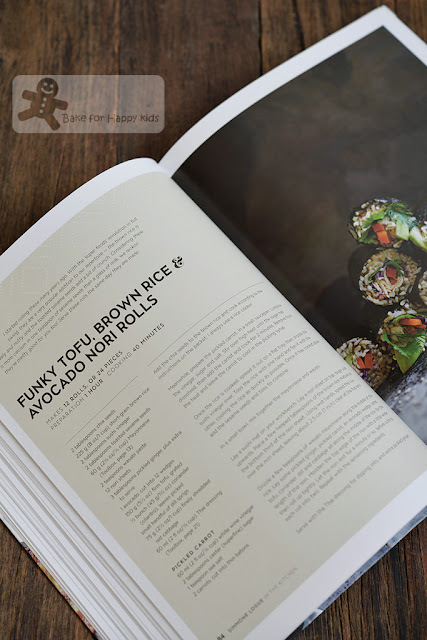 Regardless, I still have to try this recipe in order to make such a comparison!!! LOL! 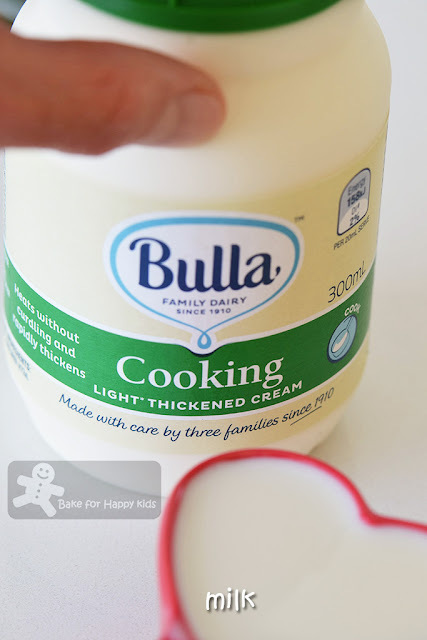 1/4 cup (60ml) sour cream, regular with 35% fat - please do not use fat reduced ones. 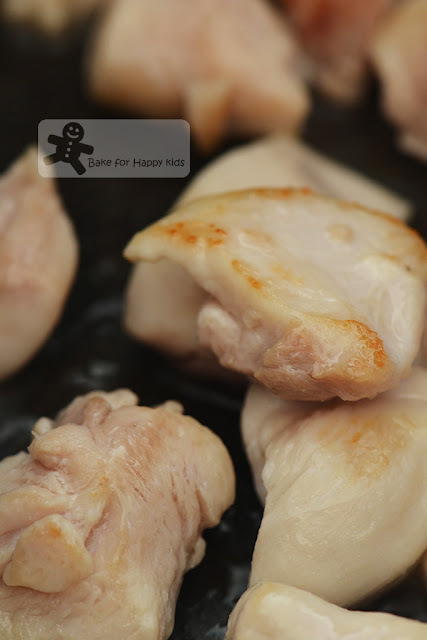 250g skinless boneless chicken thighs, cut into 5 cm (2 inches) chunks - please do not use chicken breast! 1) To make the pastry: Combine flour and salt. Using a food processor or your fingertips, process or cut butter into the flour and salt mixture. Pulse or rub until the butter and flour are incorporated into large crumbs. Add sour cream and pulse or mix until a dough is formed. Wrap dough into a cling wrap and leave it to rest in the fridge for 20 mins until firm. 2) While chilling, cook the filling. Heat oil in saucepan over medium high heat and sauté chicken in batches if required for about 5 mins until nicely browned. Transfer chicken to a plate. Set aside. Sauté chicken until they are nicely browned. 3) Using the same pan, melt butter in it over medium heat. 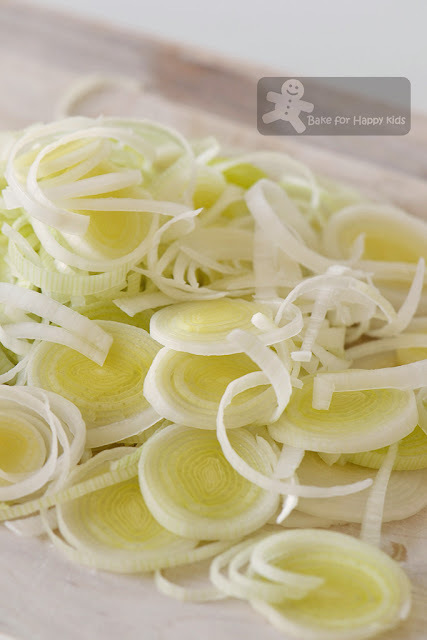 Sauté leek, garlic and bay leaves for 5-10 mins or until soft and fragrant. For this step... I need to add these cream and milk. 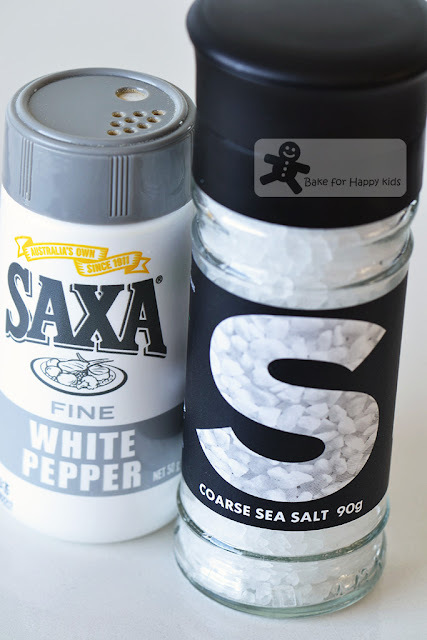 And I need to add these white pepper and salt too. So here we go... The filling is done! 5) When the filling is chilled enough, assemble the pies. Preheat oven to 180°C (350°F). Use extra melted butter and cooking spray to grease ramekins or pie dish. On a lightly floured surface, roll pastry to about 8mm (3/8 inch) thick and cut pastry into 4 x about 15 cm rounds. 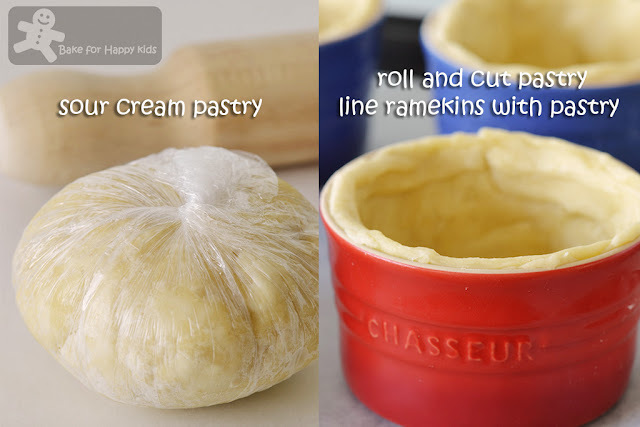 Line pastry into the prepared ramekins or pie dish and trim off any excess overhanging pastry. Fill with chicken filling. 6) Using a pair of kitchen scissor, cut filo 6 (or 18 if you are making one 23 cm pie) pieces of pastries into half and you will have about 12 (or 36 if you are making one 23 cm pie) pieces. Place the trimmed pastry in a clean plastic bag or cover with a damp cloth to stop them from drying out. 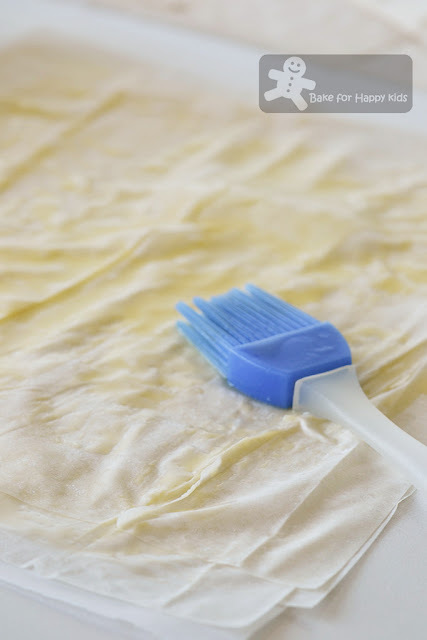 Take one piece of filo pastry and brush with melted butter. 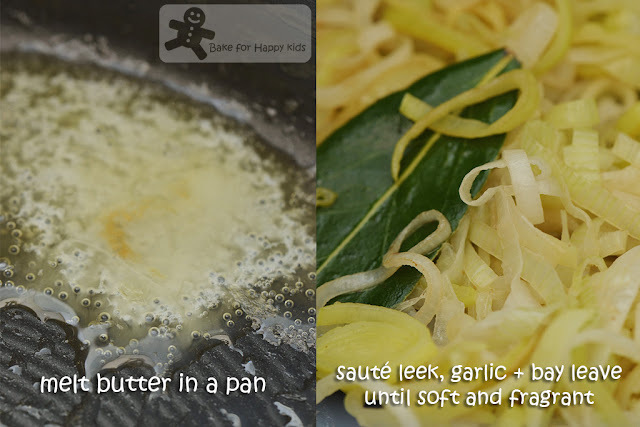 Top with another, brush with more butter, top with a third filo and brush with more butter. Scrunch the filo layers and place on the top of one medium pie or anywhere on top of the large pie. Repeat with the remaining pastry and butter until you have completely topped your pie/s. Brush the completed pies with remaining butter and sprinkle with salt. Top and brush. Top and brush. Top and brush. 7) Bake for for 30 mins or golden brown with crunchy tops! Serve immediately while they are nice and warm. 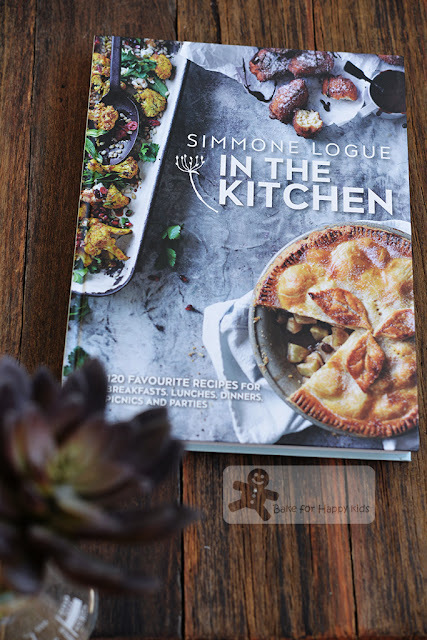 All thanks to Simmone Logue, the author of the book, In the Kitchen. 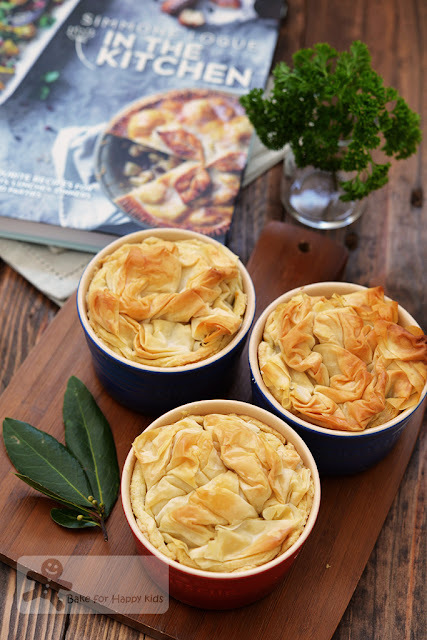 These modern country style chicken leek pies are yummy. Want more country pie recipes? There are a lot more in this book. 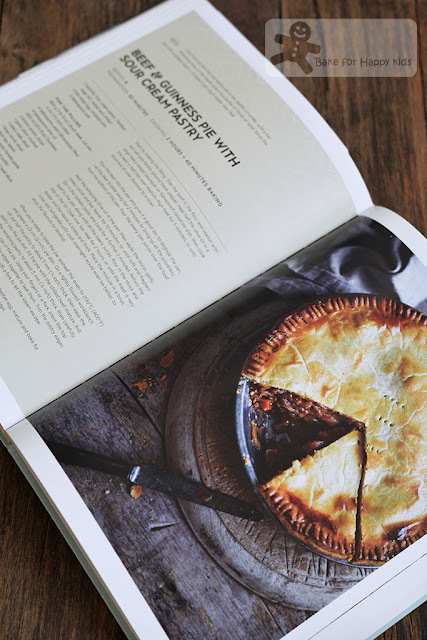 I was thinking of baking this beef and Guinness pie for my red-meat-eating husband and son but chose chicken eventually because I prefer chicken. Yeah... I cook I choose. Ha! Ha! 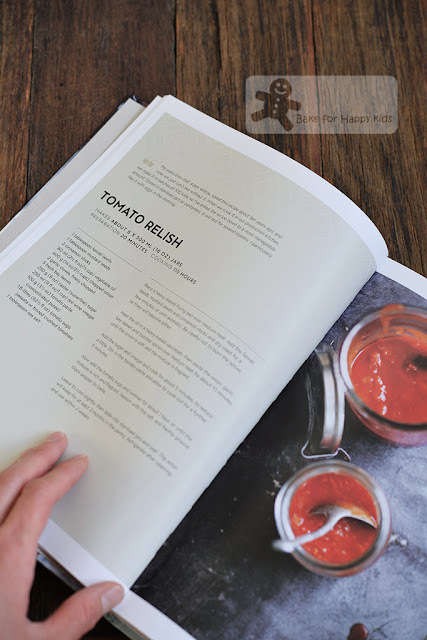 The book starts with Simmone's favourite basic recipes like the tomato relish, pesto, mayonnaise, chilli jam, dressing and etc. 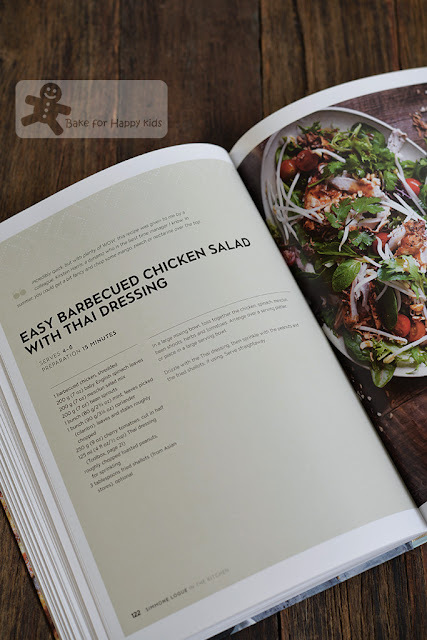 And this recipe is found in the chapter of picnic lunches in this book. 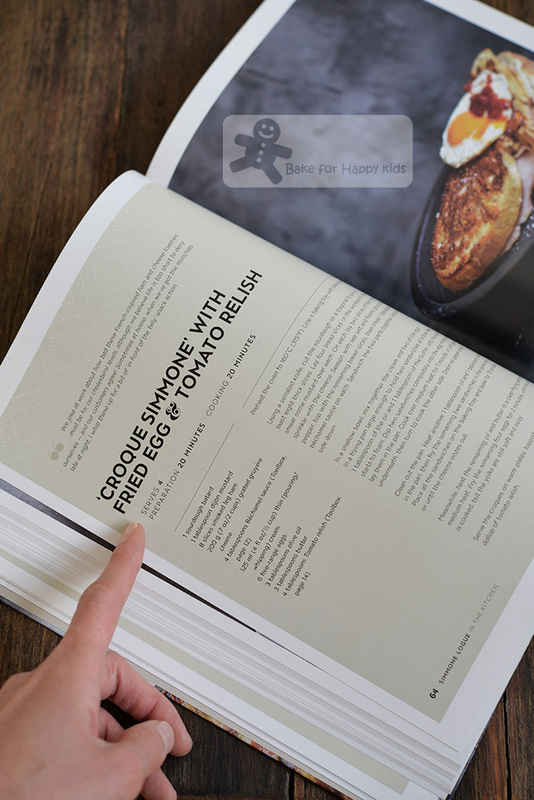 I noticed that Simmone is very good in incorporating Asian flavours into her country food. Relaxed. Country. Flavoursome. Fusion. Stylish. Fresh. Beautiful. I hope that you can see the deep beauty of this book as much as I do. 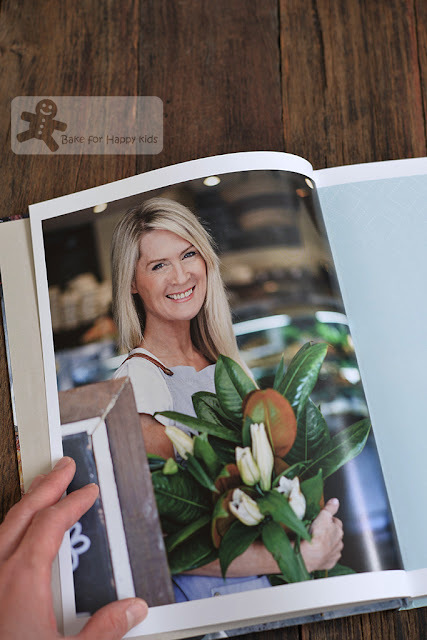 If you want to own this book, you may wish to know that it is available now in most retail or online book shops selling at the retail price of AUD$39.99. Zoe, these cocotte with filo pastry look yummy and crispy. We love chicken pie too, but I have never tried making it with Filo pastry before. I can almost hear the crunch! Looks delicious! Meat pies are so good, aren't they? Chicken is my favorite. Never used leeks in one for some reason, though. Gotta try this! Looks scrumptious. Thanks! Rustic and delicious! I love filo pastry and it's such a yummy addition than a regular pie crust! I really must make these individual pies soon, I know everyone in my family will enjoy them!